NORTHAMPTON, MA. 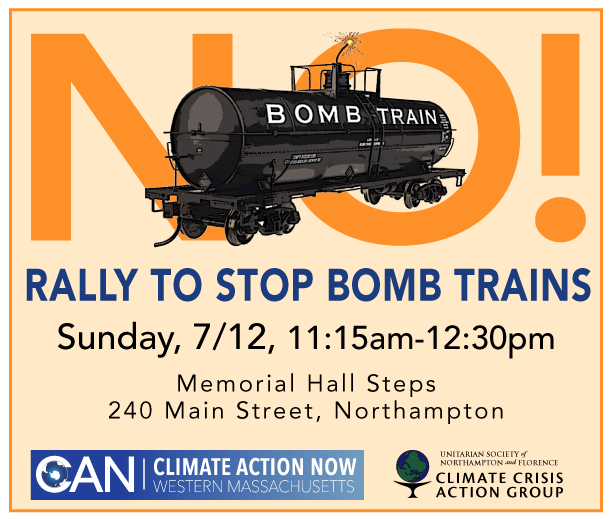 On Sunday, July 12 at 11:30 am there will be a protest vigil commemorating the two-year anniversary of the deaths of 47 people and the destruction of the town of Lac Mégantic, Quebec when a train carrying Bakken crude oil derailed and exploded there. Climate Action NOW/350.ma and the Unitarian Society of Northampton’s Climate Action Group are spearheading the protest, which will be held in front of Memorial Hall, 240 Main Street in Northampton. There has been an enormous increase in the number of “bomb trains” carrying their dangerous cargo throughout the United States. The New York Times reported in January 2014 that about 400,000 carloads of crude oil had traveled by rail the previous year to the nation’s refineries, up from 9,500 in 2008 – an increase of 4,111%. Regulations governing the fragile tank cars and the nation’s deteriorating railway infrastructure are widely seen as inadequate. One hundred thirty-five trains a day run within a mile of the homes of over 25 million people. In Massachusetts, these trains may travel a route paralleling Route 2 (data not confirmed). The number of accidents has also climbed steeply. From 1975 to 2012, federal records show, railroads spilled 800,000 gallons of crude oil. Last year alone, they spilled more than 1.15 million gallons, according to an analysis of data from the Pipeline and Hazardous Materials Safety Administration. The “bomb trains” may be as long as 100 cars, magnifying the risk. Their cargo of Bakken crude and tar sands oil is more volatile than other grades of oil. ForestEthics, a nonprofit environmental coalition, has designated July 6-12 as a week of awareness and action against the oil trains in memory of the victims of Lac Mégantic. Over one hundred events have been organized across North America, of which this protest is one.